Open the canned duck legs and scoop out half of the fat and store for use another day. Place the can of duck in a bain-marie/double boiler on medium-high heat. Cover the can with a lid so it doesn’t splatter. Heat the can until the duck fat completely melts and liquefies. While the can is heating up, peel and rinse the potatoes and dice into small pieces so they will cook quickly. Place the potatoes in a large pot with water and boil until tender. While the potatoes are cooking, remove the duck legs from the can and place them in the glass casserole dish you will use to cook the dish. Remove the can from the bain-marie and set aside, saving the fat for the potatoes. When the duck legs are cool enough to handle, remove and discard the skin and finely shred the meat by rolling in your hands. Make sure to remove all bones and leave no chunks of meat. 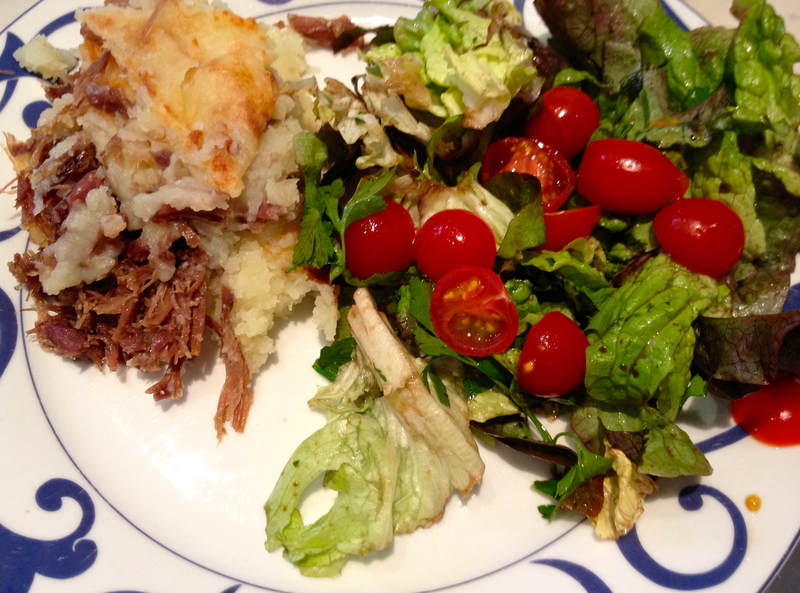 Spread the shredded duck in an even layer on the bottom of the glass casserole dish. Sprinkle with garlic powder (or fresh garlic, minced). When the potatoes are cooked and soft, drain and mash with a potato masher/ricer. Add half of the remaining duck fat from the can and mix well. 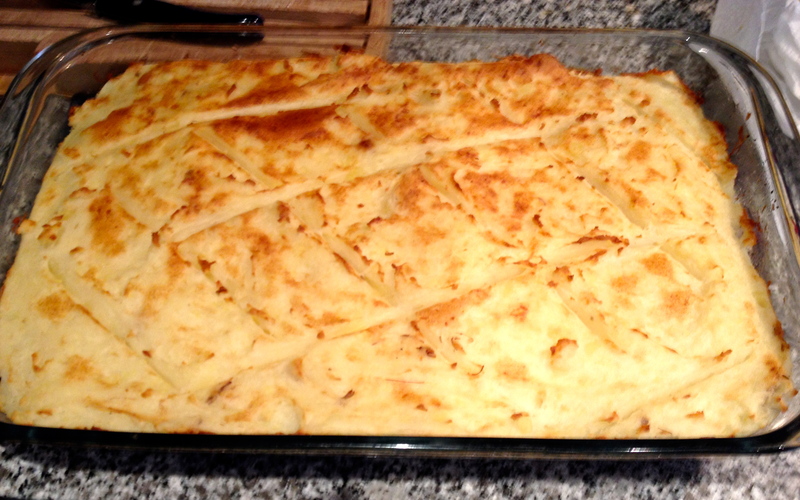 Spread a layer of potatoes (not too thick) on top of the duck and score the top with a criss-cross pattern. Reserve the remaining potatoes for another use. Place the dish in the oven preheated to 225°C (≈440°F). Bake for 15-25 minutes. Optional: If you are crazy for mushrooms like me, clean and slice 450g (16 oz.) of Cepe mushrooms and fry with a little bit of duck fat (or white wine). Add some fresh chopped parsley once the mushrooms are cooked. Spread the mushrooms and parsley evenly on top of the duck as the middle layer between the duck and potatoes.